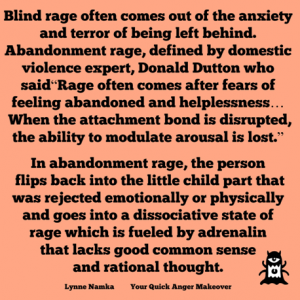 Blind rage often comes out of the anxiety and terror of being left behind. 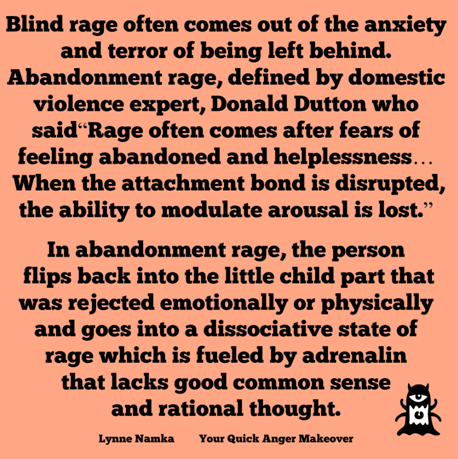 Domestic violence expert Donald Dutton defines abandonment rage by saying, “Rage often comes after fears of feeling abandoned and helplessness. A child is made furiously angry by a parent’s threats to desert him but on the other hand, he does not express that anger in case it makes the parent actually do so….the anger of a parent becomes repressed and directed at someone else later on.” Repressed anger then becomes displaced or put on someone else after frustration builds up to a boiling-over point. When the parent/child attachment bond is disrupted, the ability to modulate arousal is lost. In abandonment rage, the person flips back into the little child part that was rejected emotionally or physically and goes into what criminal behavior specialist Reid Malloy, who wrote Violent Attachments and Violence-Risk-Threat-Assessment, calls a “catathymic crisis.” The intense emotions of anger are substituted for feelings of vulnerability. This is a dissociative state of rage which is fueled by adrenalin that lacks good common sense and rational thought. Rage is an emotion generated by midbrain arousal when the prefrontal cortex goes off line. It is the energy of the out-of-control, tantruming little child who ruminates on how bad they feel. There is tunnel vision where simpler strategies come forth to deal with the unbearable emotional threat to the self. The impulse control mechanisms of the brain are lessened and there is lack of empathy for the partner who wants to leave accompanied by extreme anger. Fear, terror and anxiety may lie underneath. The intense reaction of becoming anxious and then angry when faced with being rejected is called abandonment rage. Fear and the anxiety around it can be paralyzing. Psychotherapist Deena Stewart said, “Anxiety breeds blindness.” This scenario may relate to crimes of passion and murders of domestic violence that happen when one partner leaves another. If you rage when someone you care about threatens to leave, honor this strong emotion as it’s probably there because you have reasons. Those infantile feelings of helplessness and hopelessness that naturally came up when you were left can be addressed. To continue to rage, however, is to be stuck in rage. Early neglect has a biochemical effect on the child’s developing brain. The research on the neurochemistry of the brain shows that being rejected activates the anterior cingulate and right vertical prefrontal cortex of the brain. During threat events, the blood and energy leave the rational areas of the frontal parts of the brain sending the person into the Fight Response. If you have anger and rage at being abandoned at an early age, there are raw places and raw nerves that have to be examined gently to become healed. The weight of the devastating emotions that are hooked to the wounded places have to be unhooked and released. Fortunately our brains have a plastic quality and can be re-mastered through conscious intent and positive approaches and exercises. Finding and speaking the hurt, disappointment, terror and loss at not having your necessary earliest needs met may help create security and emotional connection. However, understanding that others may or may not have the ability to deal with your feelings or care about them is part of becoming a mature person. Expecting a partner or child to make up for the wrong done to you in childhood is a major error in thinking. You and only you are responsible for your own feelings. It is wonderful to feel that you are being heard and validated today, but the moment you demand this, you create distancing. “You must meet my needs because my parents didn’t” can cause a partner to feel resentment and want to get away. If you were rejected or deserted as a child, it is imperative that you do not abandon yourself now. It is important that you learn to be there for yourself. You will need to work through those negative core beliefs about being unworthy, unlovable or undeserving. Honor that cast-off child who was denied his or her basic needs. Give yourself permission to accept and love that little child who was unloved. Find those who are really there for you in your corner-friends, family members and even a therapist, who not only like and respect you but can also help you learn alternative responses to anger and find the real you. Help is out there with therapists who are cross trained in many of the new approaches. Anger management classes and psychotherapy can help you address neglect and abandonment issues. Meditation, the tapping therapies, Acceptance and Commitment Therapy, Eye Movement Desensitization and Reprocessing (also known as EMDR), visual imagery, neurofeedback and deep processing all work to calm these over-excited areas of the brain. 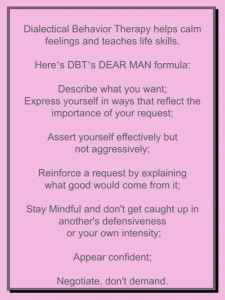 Cognitive behavioral therapy can be utilized to address the fear thoughts of not being able to stand the intense pain of being left by someone. Mindfulness and Somatic Experiencing are some of the techniques that help reset the excitability of the brain. 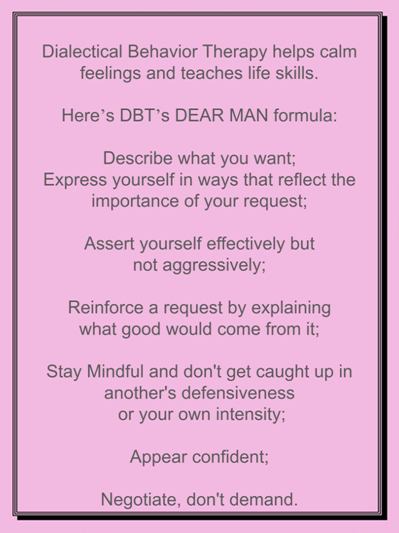 Dialectical Behavioral Therapy teaches how to develop self-regulation skills to decrease high-anger arousal and impulsive behavior.